Buckie lies either side of the the mouth of the Burn of Buckie where it flows into the Moray Firth. 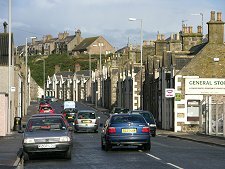 It was formed by the growing together of a series of once separate fishing villages: Nether Buckie, west of the Burn of Buckie (and now known as Buckpool), Easter Buckie, Yardie, Ianstown, Gordonsburgh and Portessie. The oldest part of Buckie lies in the almost separate settlement of Rathven, inland from Ianstown. Settlement here dates back at least 1,000 years, with a church established by 1200 and a hospital for lepers at around the same time. 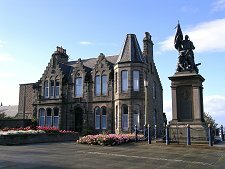 Buckie itself began to take shape in the late 1700s and early 1800s. A new town was laid out along the ridge above and behind the fishing villages by the lairds, the Gordon family of Cluny, whose grand mansion, Letterfourie House, had been built a little inland by Robert Adam in 1773. 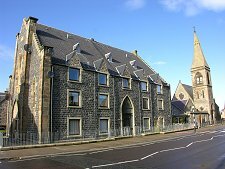 The new town revolves around Cluny Square, with East Church Street and West Church Street running off it to form the axis of a grid pattern. Cluny Square is now the finishing (or starting) point for the Speyside Way. 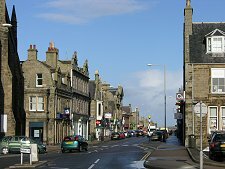 Parts of the attractive town that emerged are still on view, though the town centre is bypassed by the A942 which runs along the shoreline, and by the A98, which follows a line a mile or so inland. But the heart of Buckie is its harbour. 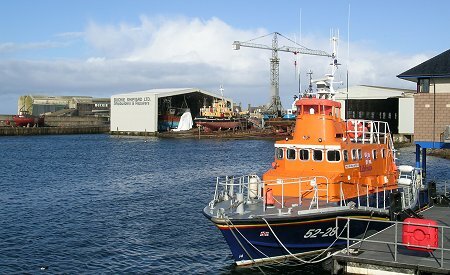 The huge harbour you see today, the Cluny Harbour, was built by the Cluny family in 1877 at a cost of £60,000: and at the time it was one of the finest harbours in Scotland. This was actually their second attempt to develop a harbour here, having previously built Nether Buckie Harbour a mile or so to the west in 1857. This had a tendency to silt up and so the Cluny Harbour followed. 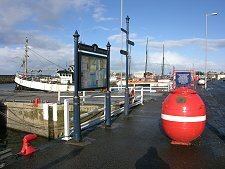 Nether Buckie was renamed Buckpool on 1886 and Buckpool Harbour was filled in for use as a park in the 1970s. 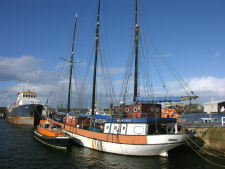 Buckie's harbour remains one of the most active and fascinating in Scotland. 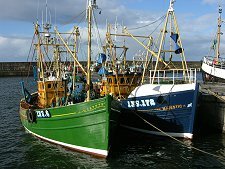 Despite the setbacks that have befallen the Scottish fishing fleet in recent years this remains a great place to see fishing boats going about their business. 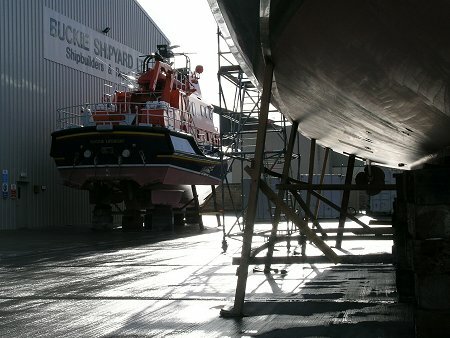 It is also unusual in remaining home to an active shipyard.